The limiting factor of oxygenation at normal pressures (1.0 ATA) is our own blood and tissue physiology. At 1.0 ATA (atmospheres absolute), the red blood cells are able to carry only a limited amount of oxygen, which includes a very small percentage (about 3%) dissolved into our blood plasma. At higher pressures, oxygen is more readily dissolved in all bodily fluids, including blood, plasma, lymphatic fluid, cerebrospinal fluid, and interstitial fluid. This increase in oxygenation helps to reverse states of tissue oxygen depletion, known clinically as hypoxia, which is often a leading cause of cellular damage during disease states. 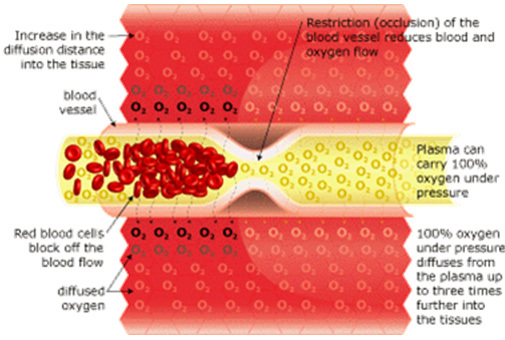 The following picture depicts restriction of blood flow due to injury, disease, blood clot, etc resulting in tissue break down due to lack of oxygen. 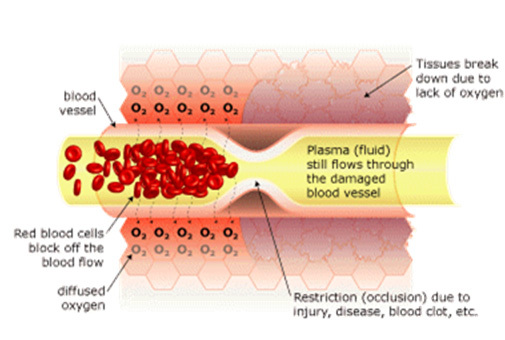 Plasma can carry 100% oxygen under pressure and diffuses from the plasma up to three times further into the tissues. 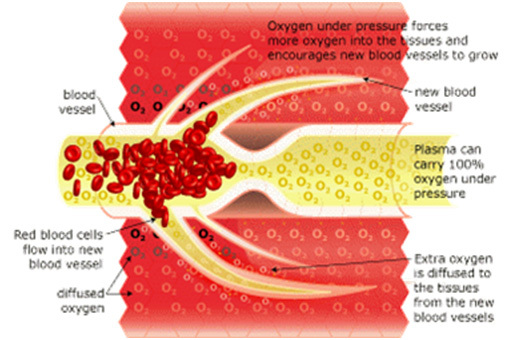 Oxygen under pressure forces more oxygen in to the tissues and encourages new blood vessels to grow. 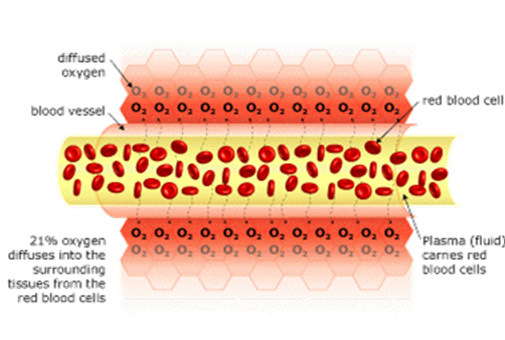 Extra oxygen is then diffused to the tissues from the new blood vessels.